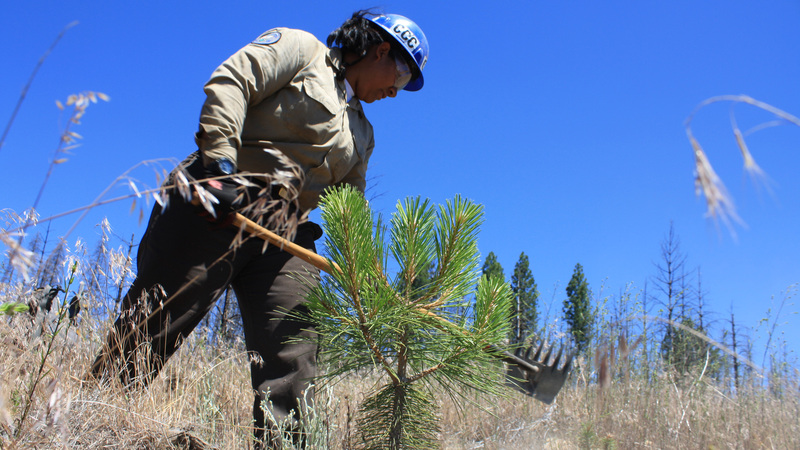 Corpsmember Zuleyma Renteria clears vegetation around a recently planted tree near Ackerson Meadow in the Stanislaus National Forest. Driving to Yosemite National Park along State Highway 120, the devastation from the 2013 Rim Fire is impossible to miss. But, look closer and it’s clear the forest is on the mend. The Stanislaus National Forest will take decades to restore. It is an acre by acre process of physical labor using hand tools, chainsaws and buckets of sweat. “It’s brutal work, but honestly I love the work that we do out here,” said Corpsmember Patricia Saucedo. She’s one of more than 30 young men and women of the California Conservation Corps devoting this summer to undoing some of the damage from the Rim Fire. The Rim Fire began August 17, 2013; scorched 257,314 acres, destroyed more than 100 buildings and homes, and burned more than half of the Groveland Ranger District making it the largest fire in the history of the Sierra Nevada. Corpsmembers involved in the project are part of the first ever Yosemite Tent Camp where CCC crews camp for six straight months in Buck Meadows near the project sites. Corpsmembers spend their days toiling in the summer heat using hand tools with odd names, like McLeod and Pulaski to cut away competing vegetation and help give newly planted seedlings a better chance at survival. Daily, Fayeninerowe and her fellow Corpsmembers hike to their project sites – sometimes several miles in – to reach the seedlings that are now two three years old and barely knee-high. “We’ll do that for about five years. By that time, the root system for the trees will be big enough to get more water before the rest of the plants,” said Gmelin. With drier winters and more persistent drought conditions, water is at a premium. So, Corpsmembers are also removing grown conifers. Some of the trees were killed during the fire, others are being sacrificed for the greater good of the forest. It’s why campers in the area may often hear the hum of chainsaws and the crashing thud of downed trees. 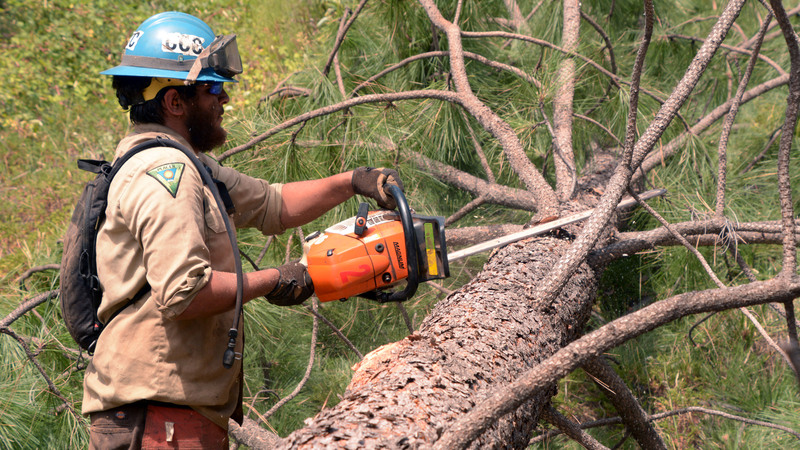 Corpsmember Jesus Lopez uses a chainsaw to remove branches from a downed tree at the Lost Claim Campground in the Stanislaus National Forest. “They’re not huge trees, but the idea is that we take out those small to medium trees and let the big ones grow healthy,” said Devin Haupt, a CCC crew supervisor. It is demanding and potentially dangerous work. Corpsmembers work in teams of two and three to carefully cut and drop the trees. They then saw the trees into more manageable pieces, turning them into wood chips or setting them aside for winter burn piles. While the Yosemite Tent Camp crews end their work this fall, the Rim Fire restoration goes on for the next 50 years. Gmelin says by then, the seedlings Corpsmembers are now nursing will be 60 to 70 feet tall. 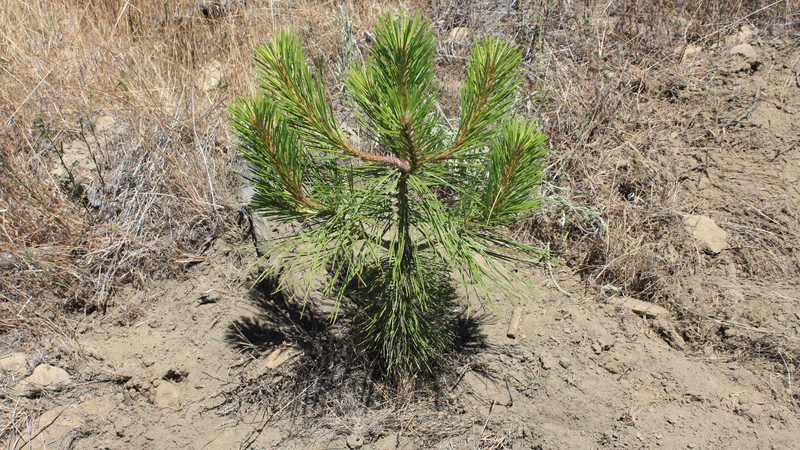 An up close look at a recently planted conifer in the Stanislaus National Forest. In 50 to 60 years this tree will be 60 to 70 feet tall. Keep in touch with latest news and updates from California Conservation Corps.